Remarkable improvement in PCOD, Thyroid and Migraine. 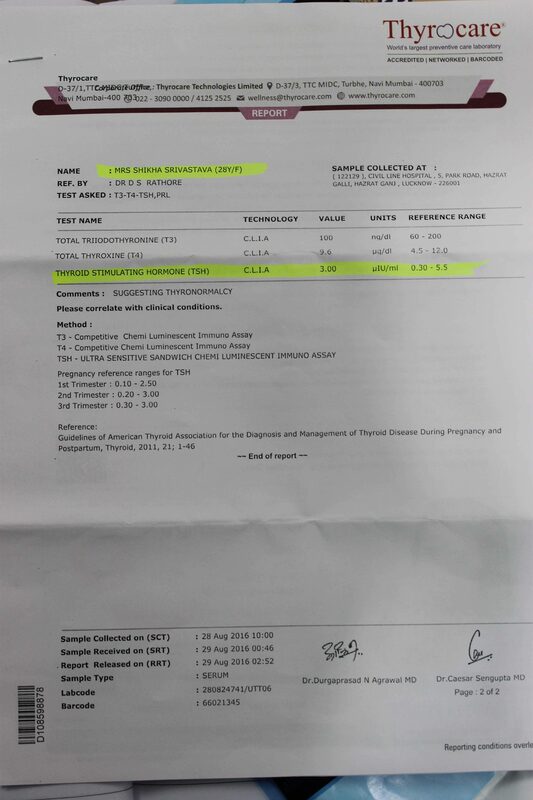 Mrs. S came to consult Dr. Ravi on June 2016 with complaints of thyroid, migraine and PCOD. She complaint of delay in menstrual cycles right from the first time since she got her periods at the age of 14 years. There was irregularity in the menstrual cycle. She had complaints of irregular scanty menses with a significant weight gain. She is suffering from thyroid since 10 years and also complaints of vertigo, nausea, burning sensation in the palms and sole of feets and hoarseness in the throat. She also had a severe migraine problem since 2011, describing her migraine pain she said that there is an unbearable pain at the vertex especially right side. She can’t move head while in pain as she believes that it can increase the pain. The migraine was so much severe that she had to take painkillers to reduce it. In the past, she had problems in conceiving due to PCOD. Due to her problems, she believes that she can’t have children in future. This made her more frustrated and worried. She missed her period for 3 months, so she consulted the gynaecologist. Doctor referred her for USG and in her sonography report, there were multiple small peripheral cystic areas in both ovaries which increased her tension. She consulted many gynaecologists since then but still there was no improvement in PCOD. Gradually her thyroid and migraine problem keep on increasing which made her worried and anxious. She came to know about Dr. Ravi from her relatives. So, she consulted him with PCOD- cyst in both ovaries, irregular menses, migraine, increased thyroid and increase serum prolactin. Dr. Ravi studied her case in totality and started the treatment process. When she came to report after a month she was happy as her USG report was normal and there was an improvement in her migraine pain. Now she is hopeful and believes that she will be fully recovered soon. When she came for follow up on 11th Sep 2016, she complaint of chapped lips. Dr. Ravi suggested her to take care of eating habits because this is the sign of Vitamin C deficiency. Sometimes she feels weak from inside. There was an improvement in her migraine episodes. There is no occurrence of severe migraine episodes but still there is heaviness in head. When there is any mental stress, she starts feeling mild pain. She continued treatment for 2 months and when she came for follow up in January 2017, she was very happy and gave the good news of her pregnancy. At the same time she was worried and tensed about her condition because her PCOD was cured but still there are problems of thyroid and migraine. She was hopeful and positive towards the treatment process. When she finally came for consultation on 5 March 2017, she came with USG report and T.S.H report. She was happy with the treatment process because her TSH was normal, PCOD was cured and there was relief in migraine. During this span of time, her mental complaints has also improved. She came to consult Dr. Ravi with her child. She was happy with the medicine transmission process. There was no recurrence of severe migraine episodes. There is relief in her headache and her PCOD was totally cured. Although she can't sleep properly because of her child but than also there is no mental stress and anxiety involved.